As I showed in my article yesterday, implying the passage of time in a photograph by blurring it can make the image unique and help it tell a story. Yesterday’s photo was a group of cyclists streaking by on a street in Hanoi, Vietnam. For moving objects, like cars, motorbikes, or kids running a soccer field, you typically want the main subject to be in focus, with the background blurred. But there are other ways to include blur in a picture. 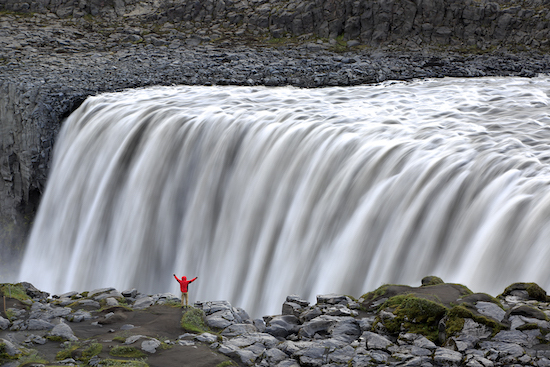 See the shot below, for example, taken at Dettifoss waterfall in Vatnajökull National Park, Iceland, with a red-coated man standing near the edge of the falls. First notice the composition: I included no sky because it was gray and unappealing. The man in red adds a nice touch of color and provides scale (these waterfalls are, like, big!). And I placed the man on the lower left side of the frame (not centered) to make the picture a little more dynamic. Now notice where I added the blur: only on the waterfalls, which are, of course, moving. With this technique, you control the gauziness of the moving water by changing your settings, which in turn depend on the speed of the water. Like the commuters in Hanoi, you need a good starting point when adding blur, followed by some trial and error. Notice the areas of the picture that are in focus: the man in red and the gray rocks. This is quite different from the everything-is-blurred technique I applied in the Hanoi photograph, and it provides a nice contrast between the fast-moving water (power!) and the static rocks and small man (puny!). Other subjects that would look great by applying this blurred technique include light streaks (cars, buses, and other vehicles), dancers, moving water of any kind (not just waterfalls but rivers, creeks, and waves too), people (walking, running, playing sports), and much else besides. Any subject that includes a moving element has potential for improvement using one of these blur techniques, so give it a try next time you are out and about shooting.